Today is the Thanksgiving holiday in the United States. Many other countries also observe a Thanksgiving holiday at different times of the year. 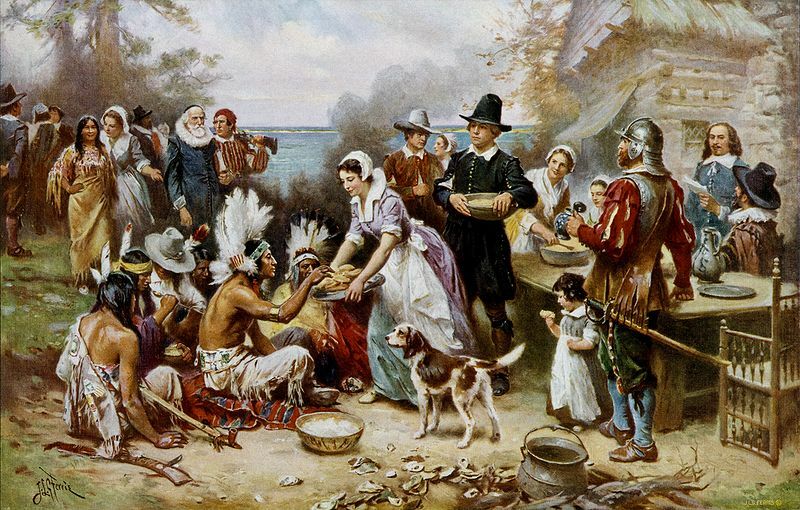 As you know, our modern Thanksgiving holiday has its roots with the Pilgrim settlers in Plymouth, Massachusetts. The first Thanksgiving in 1621 was not intended to be holiday, but a typical post-harvest celebration. The feast at the Plymouth Plantation included the Native Wampanoag, who had shared their stores of food with the settlers during the previous winter. Although there were various other Thanksgiving celebrations and declarations throughout the early history of our nation, Thanksgiving became an official holiday in 1863. In the middle of the Civil War, Abraham Lincoln proclaimed a national Thanksgiving Day to be celebrated on the last Thursday of November. In 1941, Congress passed a law recognizing the fourth Thursday of November as a national day of Thanksgiving. The change in dates was economically motivated. At that time it was considered inappropriate to engage in any Christmas advertising before Thanksgiving. An earlier Thanksgiving gave retailers more time to sell Christmas merchandise, which could be an economic boost in the middle of the Great Depression. There is nothing inherently sacred about the day Thanksgiving is celebrated, but changing the date is a reflection of the heart and attitude of the American people. The original Thanksgiving celebrations and proclamations were born out of adversity and tribulations. Modern Thanksgivings seem more focused on launching Christmas shopping, than a day of reflection and giving thanks. Take a moment and reflect upon the first Thanksgiving and the Lincoln proclamation. The Pilgrims had experienced a very difficult first winter in America. Many died, and without the help of the Wampanoag, more would have perished. Yet a few months later, they were celebrating a bountiful harvest. Although many had suffered greatly, they still had much to be thankful for. Same goes for Lincoln. In 1863, America was in the middle of a bloody civil war. Although the war efforts were turning in favor of the Union, fighting was still very fierce. The Battle of Gettysburg had been fought less than five months previously. As citizens and families fought each other, Abraham Lincoln still believed it was important for the nation to give thanks. Being thankful is determined by your attitude, not your circumstances. Giving thanks is not a denial of your situation. You may be in the midst of a great battle or tragedy, just like the Pilgrims and Abraham Lincoln. Without denying your current state, I believe you can still give thanks. With very few exceptions, you don’t have to look far to find someone who is experiencing a greater loss. I’m not trying to minimize your pain, loss or suffering. I’m just trying to help you have a perspective that will allow you to be thankful. It’s easy to be thankful when you’re in a season of plenty or life is fantastic. It’s much harder to give thanks in troubled times. When you have a thankful heart and spirit, you can give thanks in all situations. I hope you have a Happy Thanksgiving and take a few moments to reflect and give thanks… even in troubled times. Congressional Ethics: The Questions Not Asked Taxing Rich People: Who Are They?